Mandarin VIP Experience tours will be offered on a weekly basis through June 1, 2019. For more information and to book a reservation, guests can visit www.ush.cn and www.UniversalStudiosHollywood.com or call 818-622-8477. The Mandarin VIP Experience complements Universal Studios Hollywood’s popular VIP Experience. Helmed by expertly-trained tour guides, the VIP Experience offers guests from around the world a front row seat to the magic of movie and television production with escorted express access to all rides and attractions, behind-the-scenes access to movie and television sets and soundstages, including the legendary Property Warehouse and the Costume Department, along with exclusive entry to a reserved VIP lounge, a gourmet buffet lunch in a private dining room prepared by the theme park’s executive chef and valet parking. 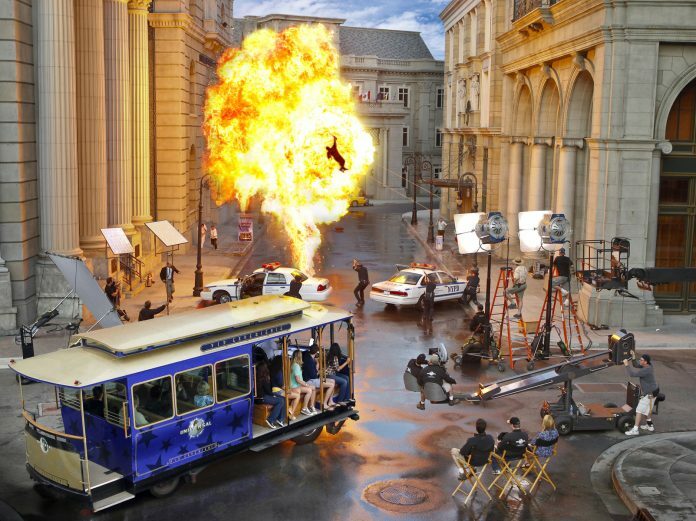 Universal Studios Hollywood’s VIP Experience is a full-day adventure that has guests traveling in style aboard specially-designed trolleys equipped with LED monitors featuring clips from movies and TV shows previously filmed on the lot to add further context to the exclusive tours. Adding to the insider’s look at the legendary studio, guests are invited to disembark and explore areas of the backlot typically inaccessible to the general public. From realistic exterior sets such as the New York Streets where scenes in such blockbusters as Transformers and The Sting were filmed to the iconic Courthouse Square made famous in the Back to the Future movies and To Kill a Mocking Bird, VIP Experience guests can walk along the same sets that have been immortalized in countless films, television shows and commercials. Highlights of the VIP Experience also include visits to Universal’s famed Property Warehouse and Costume Department. Built in 1915, the 130,000 square-foot, four-story facility contains over 400,000 unique items representing virtually every set dressing and handheld article ever created for the big or small screen, and the Costume Department features a diverse collection of over 800,000 articles of clothing, costumes, accessories and jewelry required for any production spanning across time. Next article‘Happy Death Day 2 U’: It’s Déjà Vu, Wah Boo-Hoo, Oh Screw You!